I love teaching children to write their names. It’s a skill they will use for the rest of their lives, and it is so exciting to help them with this milestone. 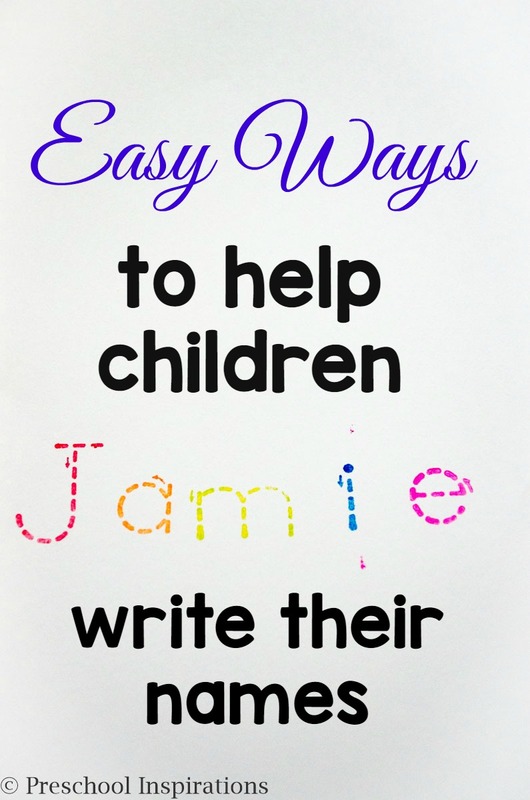 Writing doesn’t have to be hard or stressful though, so I have put together easy ways to help children write their names. I remember a day in preschool several years back where there were crayon markings all over one of our block center shelves. As I tried to think of who would do “such a thing” (this was before I had my own kids and figured out that these things happen! ), I quickly found my answer. Among the black lines was the name “Josh.” I couldn’t help but smile because it showed the innocence of the block area graffiti, and it encouraged me that children really do like to write their names! 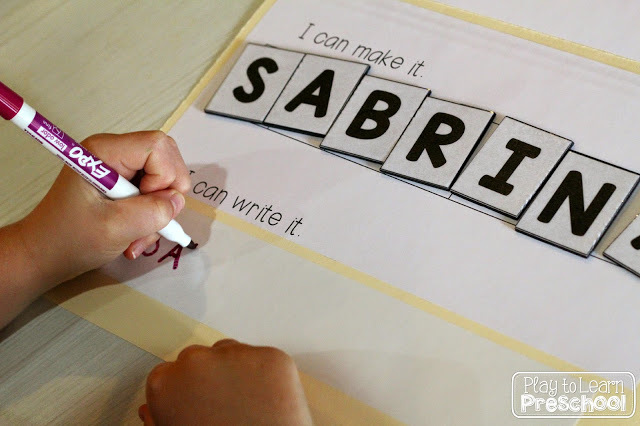 We like to do fun and special name writing activities, and of course these should be included in your preschool curriculum. But I also find it important to incorporate it into our daily routines! The key is to make it meaningful and inviting. 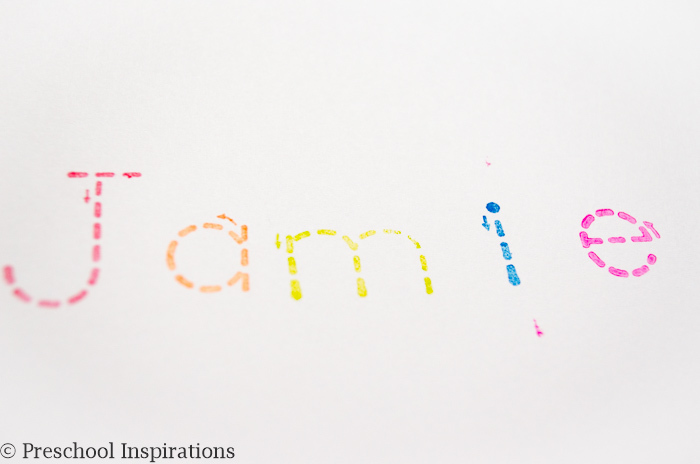 Here are 10 of my favorite ways to incorporate preschool name writing practice into a child’s daily life. This is a tactile name book I made this past year. Did you know that name practice does not need to be with a writing utensil? Children can learn to shape the letters and form them by feeling them! Leave this around a library area, cozy corner, the writing center, or any other place your child would enjoy it. Read all the details in my post Tactile Name Writing Practice. Children will find it more comfortable to write on a vertical surface, and we can help by making these available to them. Now that I think back on it, there were no vertical items in my classroom for writing practice when Josh was in my class. No wonder he was beckoned to the block shelf! Items such as white boards, easels, and chalk boards are all great. We also like to draw on windows! This is a name game that Teach Preschool did on her easel, led by the interests of the children. This idea is completely genius! Play to Learn Preschool has come up with a four step method to help children learn their names, all enclosed in a manila name folder. She uses tactile methods, matching, letter correspondence, and finally writing. Put this around the house or classroom for easy access so that your child can practice writing his name. The goal of name writing is to keep it fun and not frustrating. For little ones who are not ready to form letters yet, I love to use stamps. We have two sets of letter stamps in our classroom available. We use the Melissa & Doug Deluxe Alphabet Stamp Set as well as this Dot-To-Dot Tracing Stampers set. The Dot To Dot set is also one that my 1st grade daughter absolutely loves. She has been forming her letters from bottom to top instead of top to bottom, and the arrows are a fun way to remind her how to do it correctly. With the younger ones, I don’t focus on tracing the letters, but I’ve noticed that they start noticing that aspect once they are ready. All of my students have been intrigued by a sign-in book! They see their parents using it and want to take part too. Here is the sign-in book for Fun-A-Day. One of my favorites is when the children come in the classroom in the mornings and rush over to write their names in the book! We have journals around all the time. I usually assign a journal to each child and keep them in the book area or in the writing center. This is their space to make doodles, practice lines, or anything else they would like. Plus, it is usually one of the first places that they begin writing their names. 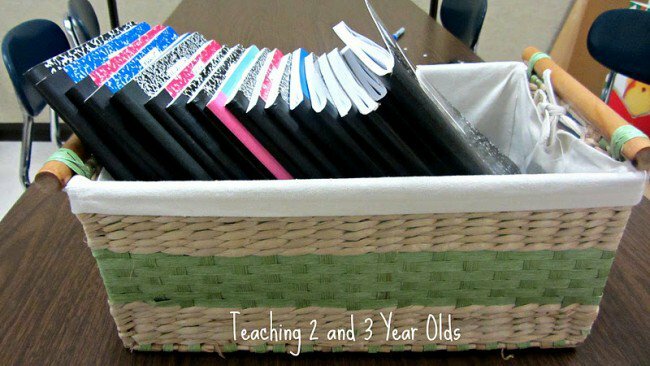 Here are some more tips for using journals from Teaching 2 and 3 Year olds. 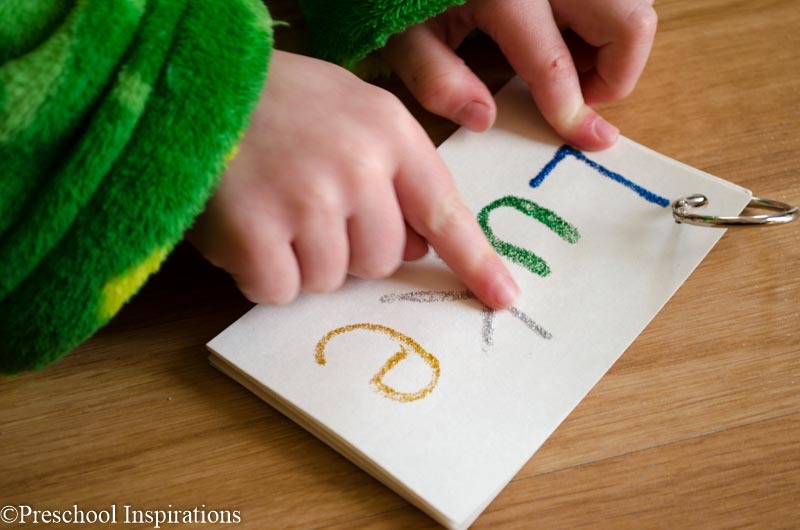 This is definitely one of the simplest ways to encourage a preschooler to write her name on a regular basis. After she finishes making a picture or project, I say, “I would love to remember who drew this. I need you to write your name on it for me.” If they are unable to write their entire name, just encourage them to write the first letter. The writing center is the perfect place for children to find materials to write their names with. Our writing center is constantly evolving, and you can see how I set it up at one point in my classroom. 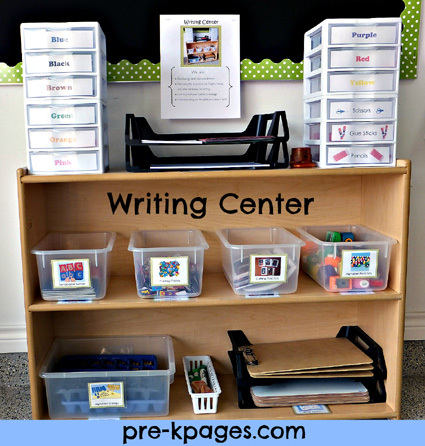 I also highly recommed reading about Pre-K Pages’ writing center, pictured below. It has so many great ideas! 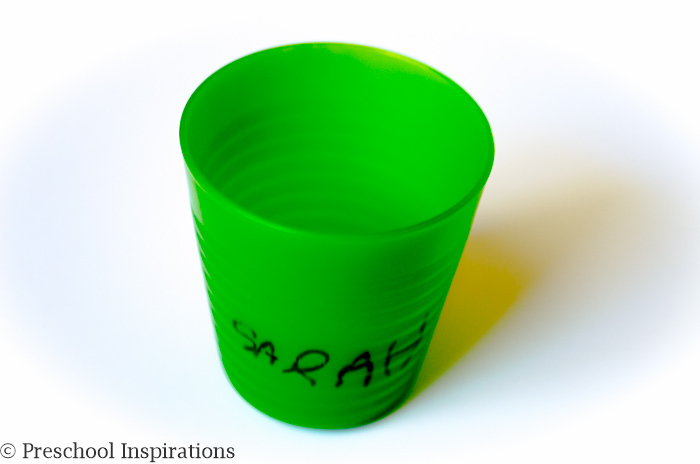 One day when three of my students chose the same color for their water cups , I wrote their names on them with a dry-erase marker. They thought it was the coolest to have their names written on a cup, so now they ask to write their own names on their cups. I made name cards last year for my class out of Brown Bear characters, and we also had name rocks. These were items that we kept around the room, but the children could also carry them around and use them for reference when writing their names. Take a look at these name rocks from Stimulating Learning with Rachel. As you can see preschool name writing practice can be fun and inviting! Do you have any favorite or unique ways to support children in this? Hi. Love your ideas many of which I have been doing for quite a while and appreciate all the resources and links. Recently I wrote each child’s full name on a word strip. I attached large lined paper to it and laminated it. I showed the children what I had done and explained that it was additional practice in learning to recognize and practice writing their names. These were placed where they could access it if they wanted to. I also explained to them that I only capitalized the first letter in their first and last name. They could try to write it that way or they could write it however they were more comfortable writing it. (Such as all capitals). The almost 2 year old is starting to recognize his name in print and likes to scribble saying, “look I wrote my name”. My other little ones are ages 3 to 5 and at various stages of writing. And as you said they all love to see their name in print. I love that idea, Adria!! It sounds so inviting!! These are excellent ideas, and not one includes tracing! Awesome! Tracing letters is a commonly used strategy that actually inhibits writing (and confidence) in the long run.